Hip Hops: Happy Belated Birthday Bradley Beal, Where's The Cake? 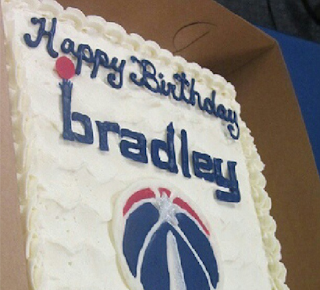 Happy Belated Birthday Bradley Beal, Where's The Cake? Arenas didn't eat his piece -- "I don't eat sweets," he said -- but had every intention of smearing the cake on Hughes's face as a joke. Jordan looked at Arenas, shook his head and whispered, "No, Gilbert." He is not having a good rookie season due to his Wizards' record. The win against Miami last night is a sweet late treat. Gotta make him one during the cake decorating courses on which Flip Saunders used to attend. Change the name and cakes like that would be nice present ideas for women. That's especially true for athletic ones.